The managing director of the European Stability Mechanism, Klaus Regling is referring to the continuation of the Cyprus program until the end, ie until March 2016. 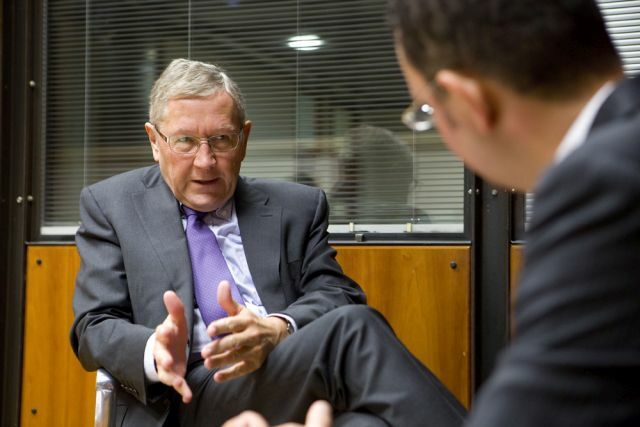 Mr Regling, while talkin exclusively to the Cypriot newspaper Politis and the finance editor, Yiannis Seitanidis, indicates that both the ESM and the troika have not been officially informed of the government’s intention to proceed to an early termination of the MoU. He argues that Cyprus has made significant progress in the program and to the adjustment of the economy towards a new economic model, but there are still several things to be done. He identifies the ESM loan facility “as a reliable safety net” and encourages the country to move in a rapid continuation of the program, which lasts, as pointed out, until March 2016. Concerning the last developments in the Greek program, Klaus Regling noted that the new arrangement for Greece -by providing the EMS a preventive credit line- passes through the completion of the ongoing review of the Greek program. The head of the European Stability Mechanism points out that if there is no specific arrangement until the end of 2104, Greece must give back the unused amounts of the Greek Financial Stability Fund. Also, the €1.8 billion that the EFSF would still disburse to Greece if all the conditions are met, would be lost by the end of the year. Commenting on the positive scenario, of reaching an agreement, Mr Regling states, that ‘this would greatly improve the market sentiment towards Greek and pave the way for a stable and sustainable recovery’. The full text of the interview to Yiannis Seitanidis, finance and economics editor in Politis. 18 months have passed after March of 2013 and the ‘rough’ decisions implemented for the resolution of the Cypriot banking system. Today, both the country and the banking system have restored part of their lost confidence. The rating agencies have raised the outlook of the country and systemic banks have passed the stress tests. First of all, how has the ESM assessed the Cypriot economy today? There has been very good progress. It has been one of most demanding programmes and, to date, Cyprus has delivered a lot. It’s true that it has been a difficult time, particularly for the population. Adjustments are painful – we know that – but the programme is being implemented and results are starting to show. You mentioned the ECB’s Asset Quality Review and the stress tests: the outcome was positive for Cyprus. The current review has been on hold because we were waiting for all prior actions to be met. Up until now implementation has been timely and economic indicators are even slightly better than initially foreseen in the programme. All this is very positive for the Cypriot economy. How has the decision of Supreme Court changed this “on hold” situation? Under which conditions will the review be closed and will the ESM be able to proceed with the disbursement? The Eurogroup acknowledged there has been a very positive development in Cyprus due to this decision of the Court and in principle agrees to move forward with the payment of the €350 million tranche. But the disbursement can only be done after all uncertainty is removed, so the Eurogroup will monitor the legislative process to ensure that the prior actions continue to be fully met. Once this is the case and the ESM Board of Directors approves the disbursement, we can complete the payment before the end of the year. The government has set the target for Cyprus to exit the MoU and the financial support of the Troika earlier than the fixed deadline, probably by mid-2015. Is this a realistic target? I can’t comment on that because the Troika and ESM have not been officially informed about this. What I can say is that things are going into the right direction due to the rigorous programme implementation, the resilience and flexibility of the economy, and the efforts of people in both the private and public sectors. That said, the adjustment is by no means completed. The restructuring of the economy towards tourism and non-financial professional services with less dependence on banks will still take years to complete. Non-performing loans are very high at €29 billion as of end-August. Banks need to put in place effective management of non-performing loans, the sooner the better. Implementing the new foreclosure law and insolvency framework will be key for durable success in this area. The programme provides a critical framework to successfully come to this end. Moreover, markets can be volatile as we have seen in the last few weeks and the programme continues to serve Cyprus as a credible backstop. The ESM encourages a swift continuation of the implementation of the programme, which runs until March 2016. The Ministry of Finance announced a debt level and a deficit ratio for 2014 and for the years to come, which is lower than predicted in the programme. Do you agree with the position of the Finance Minister, Harris Georgiades, that debt and deficit are in a sustainable level and there is no need for additional measures for the period after 2016? The Troika will analyse the data in detail but it seems quite logical that the debt level looks better now than many thought a few months ago. There are several reasons for this. The program implementation is better. The fiscal consolidation is happening faster than expected. The primary surplus could actually be reached this year, if there are no unforeseen problems. Cyprus also benefited from the revision of the national accounts on all European countries, which in Cyprus resulted in a bigger improvement of the GDP than in other countries – that also helps to reduce the debt ratio. We also know now that the AQR and stress tests results did not reveal any capital shortfall. All these things together clearly indicate that the fiscal situation is better and the debt level will be lower. To say the debt is already sustainable is a different judgment. It’s not only about one number, one ratio that would mark the difference between sustainable or not sustainable. The number of 120% is important, but there are countries with a debt higher than 120% which are sustainable and there are also other countries that had in the past a debt level much below of 120% and were not sustainable. So this depends very much on other economic factors. What is clear right now is that it is improving, more than we had expected and that is positive. Using market terminology, ESM is the biggest “investor” in Cyprus. Are you satisfied by the investment in Cyprus? Does financial support help Cyprus to face the crisis? It’s correct to say that the ESM is the biggest investor even if we are a different type of “investor”. The Cypriot government asked us in March 2013 to come to Cyprus because private investors were no longer willing to finance Cyprus on reasonable terms. Cyprus had effectively lost market access. The government made a request to the Eurogroup and the Troika made the assessment. The decision was for the ESM to get involved with a three-year programme, providing up to €9 billion. That’s a lot of money, almost 60% of GDP. It’s a very large programme on very special terms. I’m happy that the programme is working well for Cyprus. The reforms undertaken in the context of this programme are good for Cyprus. The programme helps to reform the economy, to put it on a new sound footing. There is a new business model in the making where Cyprus will make good use of its natural and competitive advantages. It is the best way to return to sustainable growth and job creation. It is good for the country and also good for the euro area as a whole. The euro area wants its Member States to grow healthy and come to a point where additional exceptional financing is no longer necessary. That‘s the main goal. We are also helping by providing financing on much more favourable terms than everybody else. The average maturity of our loans to Cyprus is 15 years and the interest rate that we charge reflects our very low funding cost, currently between 1 and 1.5%. That is an advantage for the Cypriot budget and for the Cypriot economy. We tried to quantify this advantage compared with market rates: it represents a saving of 1.5% of Cyprus GDP. That was a benefit last year and it will grow as we disburse more money. This is a real benefit, and this is a demonstration of the solidarity provided by euro area, as a whole, to Cyprus in exchange for the reforms and the adjustment. The problem is that the real economy can’t feel this benefit. Is there any thought on how Europe could transfer this benefit from the fiscal area to real economy? I know that the benefit is initially seen in the budget and is not felt by the population. The unemployment is high, real incomes are lower than pre-crisis levels. This was also the case in other programme countries – Greece, Portugal and Ireland. That is what people feel. But we must not forget that the country’s situation was unsustainable. Without our financing at very favourable lending terms, the problems would have been much worse. We know from experience of several countries around the world which have been through tough adjustment that after a while the benefits also start to be felt by the population. And if countries remain willing to reform, these benefits will last. The ESM has a specific mandate as a crisis resolution mechanism. Do you see a future wider role for the ESM? For example to use part of ESM funds to in order to finance development projects? There was some speculation recently about that. The new Commission President Jean-Claude Juncker is putting together an investment plan for Europe. He is looking at all possibilities and this option was considered but it would very difficult to use the ESM for that purpose. That is not part of our mandate. To change this mandate requires a change in the ESM Treaty, which is an international treaty – any change of this treaty requires ratification from 18 parliaments, from all euro area countries. Politically, that is very difficult. In any case we want to preserve the ESM’s main task as an emergency mechanism, because we know that one day there will be another crisis. We have to make sure that the ESM will be ready to help when that happens again. The Banking Union is a reality and the ESM will soon have a new role, which is the direct recapitalisation of euro area banks. Do you believe that ESM is ready for this role? At the ESM we are ready! The finance ministers of the Eurogroup asked us, a year ago, to prepare the ESM internally to be ready when the ECB assumes the role of single supervisor, which happened last week. We did our homework and we are ready to play this role. We still need the final legal decision by our Board of Governors – the finance ministers of the euro area. This process is going well and it is very likely to happen in the coming weeks. Internally we have concluded our preparations. If we are asked to take equity in a bank, we are prepared to do that. But after the results of the stress tests announced by ECB, I see no need to activate this instrument any time soon. In any case, we are the last line of defence and it’s good to have an instrument like this available. We are a crisis institution and should be prepared on short notice to do things that are not anticipated. Does the Cyprus banking crisis create a new model for banking resolution, with bail-in as a part of it? Cyprus was an exceptional case because of the magnitude of problems. The financing required was so large in terms of the country’s GDP that a particularly strong bail-in became inevitable. We have seen other recent cases of bail-ins, though on a smaller scale, in Spain and also recently in Portugal. The EU has now a new banking resolution scheme which requires a mandatory level of bail-in from 2016 onwards. In the future, no public money can be used in a bank without significant bail-in first. The Euro zone finance ministers backed a precautionary credit line for Greece, after the country exits its bailout at the end of the year. Can you describe the next steps, in order ESM to activate this credit line? There is a lot of support in the Eurogroup for a precautionary credit line and Eurogroup President Jeroen Dijsselbloem mentioned an ESM Enhanced Conditions Credit Line, an ECCL. But there is no agreement yet and certainly no formal requests were made to the ESM. There is an ongoing discussion and I cannot predict what will be the solution in the end. It depends on a number of issues. First, we hope that the current review will be concluded. Once that happens we will have better data. This also implies that Greece will receive the final disbursement from us and another disbursement from the IMF. Concluding the review is the one important issue which is still ongoing. We don’t know how the market situation will evolve, because there has been some volatility in recent weeks. The Eurogroup will receive all these elements and will then, hopefully, come to a common understanding with the Greek government. So, the 8th December (Eurogroup) is not a final deadline? The end of the year is important because legally the EFSF programme comes to an end. The IMF programme runs until spring 2016. If nothing happens – and that is not what I expect – then the money that we disbursed and is kept at the Hellenic Financial Stability Fund in the form of bonds will have to be returned. Also, the €1.8 billion that the EFSF would still disburse to Greece if all the conditions are met, would be lost by the end of the year. In that sense, yes, the end of the year is an important deadline. I hope that we will find a solution before that moment through a credible and prudent exit from the current programme into a follow up arrangement. This would greatly improve the market sentiment towards Greek and pave the way for a stable and sustainable recovery.